Pain is an unpleasant sensation causing discomfort to the individual. There are many causes of pain. The perception of pain is mediated by an enzyme called cyclooxygenase enzyme. It is this pain that forces people to consult a doctor. 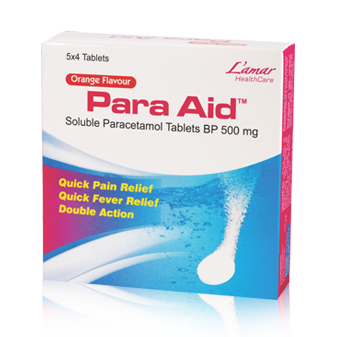 PARA AID is a soluble paracetamol tablet that performs a double action by providing quick relief from pain and fever. Increased production of cyclooxygenase enzyme causes pain. PARA AID, a soluble paracetamol tablet is used to decrease the level of production of this enzyme, thereby reducing distress and discomfort. Take as suggested by your physician. Note that it is important not to take more than the recommended dose.